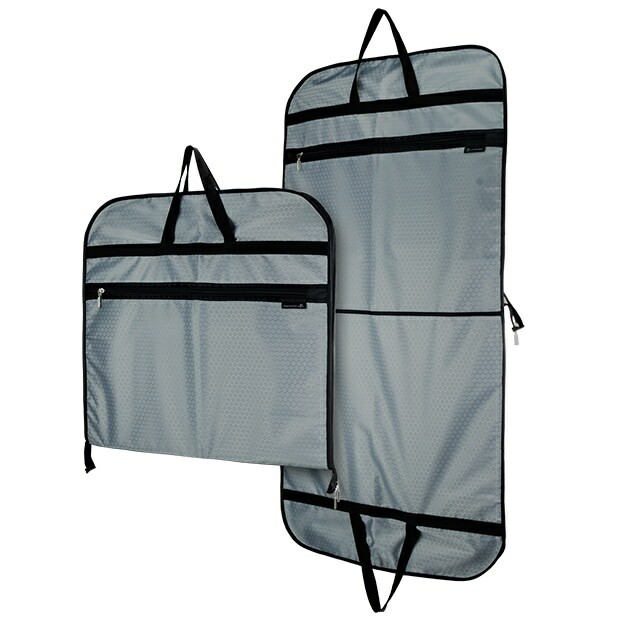 Strong grey showerproof carrier covers with handles. Ideal for suit, jackets and shirts etc. Quality full-length zip, shaped shoulders, top hole for hanger hooks. The outer side made from soft feel, showerproof, wipe-clean 420d Polyester. The black inner side is made from soft breathable 210d polyester. All around double zips secure the carrier once it's been folded in half. Safe for long-term wardrobe storage - can be hung full length. Size: Length x Width 43.5'' x 23'' (110.5cm x 59cm) approx.